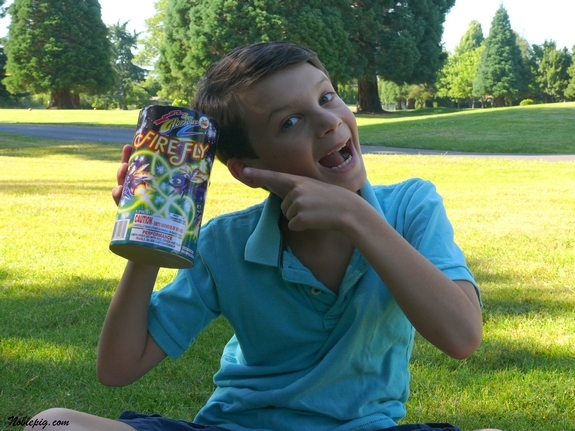 My kids have never celebrated a Fourth of July where shooting off their own fireworks was part of the fun. In fact, they didn’t even know it was a possibility. We have never lived in a city where it was legal. We do now. They are a little excited. We didn’t buy the ji-mongo block party pack but we did buy enough to apparently make them completely crazed about something they never even knew was done all over America. They assumed fireworks were only large city displays shot off in the sky. I let them each pick out their own grand finale display…behold “The Fire Fly”. 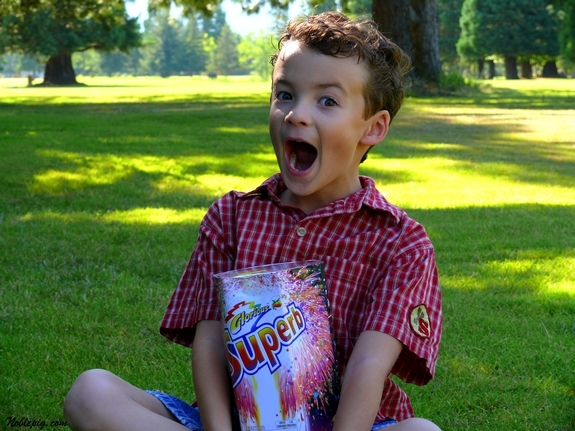 This kid picked out “The Superb.” Ummm….he is far beyond what you could consider excited. Seriously, how do you curtail this kind of crazy? The kids and I made these sprinkley-cupcakes today…avoiding unpacking has become an art form for me. Dinner…My Grilled London Broil with Sesame-Soy-Brown Sugar 24-hour marinade, my favorite potato salad, fresh creamed corned casserole, homemade artisan bread and homemade ice cream for dessert. It doesn’t get dark here until about 10-ish so fireworks will not be until then. The kids will be nuts. Happy Fourth everyone….enjoy your families and friends. WOW! Those are some huge works your kids are holding. I come from a fireworks-free zone also, and the only thing that I have ever seen up close are bottle rockets, roman candles and firecrackers. All of those things are itty-bitty by comparison. Hope you can get some pics of the display. I want your london broil marinade! LOL. Happy 4th of July! I am sure your kids are going to be having a riot! Be safe! Wow!!! Fireworks were going off here like crazy last night and my dog was in my lap trying to burrow into my shirt. It sort of became a little family joke. I’m having fun, but is it too much fun yet? Have a great 4th, Cathy! You may need a nap this afternoon . . .
HOW EXCITING! We CAN do the fireworks in our backyard, but we don’t always do it, there are so many small towns around us who do it for us! Your pictures of the boys are so cute and your menu sounds WONDERFUL! Brats sound great, I’d love to hear how you fix yours. We boil ours in beer, then throw them on a hot grill with BBQ sauce on them and crisp them up, hubby likes his with sauerkraut and I like mine with relish and onion! i have never lived anywhere where it is legal either. They look so cute and excited. Laughing myself silly at 8:00 in the morning looking at pictures of your boys. I want to be a kid again today, thanks to you! Your boys are happier being clicked now Cathy. Not until 10pm…ha ha.They’re gonna drive you bananas. 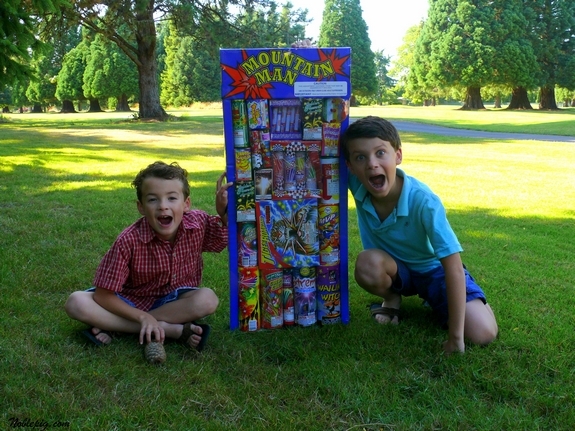 We have an Indian festival of lights here & the kids drive us crazy for their own fireworks…Hope the boys have FUN!!! I bet I’ll be able to see those fireworks from here! Have you ever posted that corn casserole recipe? Sounds great. Lordy…their faces are worth every penny you spent on the fireworks. Have fun and be safe. I want to see some photos of the blast you all will have. My kids are upset that we aren’t setting fireworks off this year (we’re in a drought down here in South East Texas). When I told my sister in Sacramento, she was surprised that we could buy fireworks. I’ve only been down here 10 years, but I’ve completely adjusted to the fireworks. It’s the idiots who shoot guns that freak me out. Have a wonderful 4th. It’s still against the law to set off your own fireworks here in NJ which is just as well because it drives the dogs NUTS! So we will walk down to the end of the street and watch the professionals (and would-be professionals) set them off over the bay – far enough away that the dogs won’t hurt themselves in trying to catch them and close enough to see everything. SWEET! Between all the fireworks and food, I wish I were celebrating at your house! Kids are so funny. We’ve never been to big fireworks with our kids but fine ones. And then we did rockets in our side yard. You’d have thought they were riding the rockets! They thought they were AWESOME!!! All they did was pop and fizzle but somehow owning them made them bigger. Yours will have a blast! Enjoy. The boys are gonna have so much fun!!! Those are some great pictures of some very excited boys. They will LOVE that awesome looking package of stuff! Have a great day! My little guy is sick, so we’ll see if he and I even get to do anything. Sigh. Hmm…. last time I avoided unpacking, it was because I was pregnant with another kid, and didn’t know it. Have a Happy 4th! I won’t play Grandma and say BE CAREFUL. Well, yes, I just did. Ahhh!!! Sugar and explosives, great combination. Have a good 4th in your new home! Happy 4th for you, the kids and the WB. 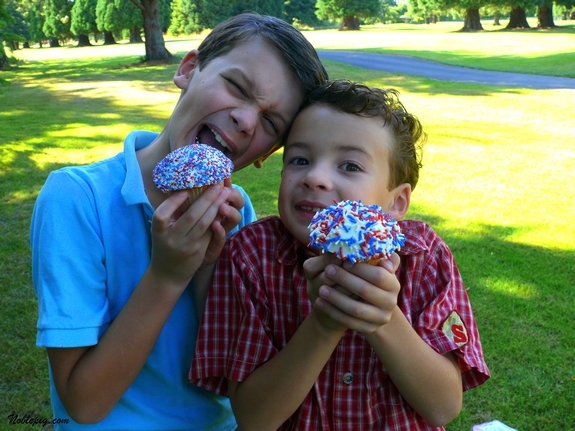 It sounds like your family is going to have a fabulous fourth – especially with those cupcakes and that great food! Just be careful with the fireworks! You just made me break out in smiles all over! My father’s birthday was July 4, so the holiday has always been a really big deal for us. He – and we – just loved fireworks. It was always soooo exciting to see what he was going to buy for us to blow up! And then there’s the season’s first watermelon to look forward to. And homemade ice cream. And…and… Let’s just say I totally understand your boys’ excitement. I hope you have a bang-up Fourth! My kids have the same reaction to fireworks! Sounds like you have a great menu planned. Wishing you lots of fun today!! You don’t need to unpack today! Relax and bask in the….um…glow and BOOM of all those fireworks! They are illegal here in Maine. I’m pretty envious! There’s a couple of my favorite faces! Enjoy your fourth! I’m off to visit Dad on the island where I’ll be enjoying some bad burgers and the best potato salad on the planet. Okay, they are adorable and this brought back so many memories of my own days as a child and being so excited for fireworks. Have a wonderful day! OMG! Those are two very cute and very happy little faces. That’s such a great time! P.S.- Is that your backyard? It’s absolutely exquisite. Who needs pyrotechnics when you’ve got those two firecrackers?! TOOO funny….we’re gonna light some up here too… ’twill be a long—but happy—day indeed! Oh Cathy, I’m so happy you are getting settled in your new digs, albeit slowly but surely. The boys look way past excited , as you mentioned. Hope ya’ll have a blast! Cathy and Fam, Have a GRAND Day; as it looks like you will. While you’re at it please be safe. Have you ever published the London Broil recipe. I am forever looking for ways to prepare that cut of meat. If not, could you please do? I looked through Davis Magazine until my eyes grew weary. Welcome to Oregon from a former Willamette Valley lover. With enthusiasm like that, your boys need something to sell. I’d buy it, whatever it was! Have a great time! Those boys are soooooo gorgeous. Can boys be gorgeous? Yes. Your boys look so excited and it’s so cute! I’m sure they’ll have a blast tonight! Getting settled in I see! The boys look right at home, life is good. Happy 4oJ. 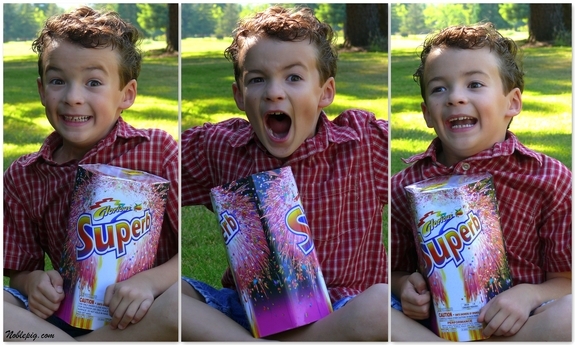 Boys & fireworks just go together! When we still had our lake house we always celebrated the fourth there. We always had tons of fireworks but we were right on the water, which made it easy to put out any fires. My only suggestion is to keep a garden hose or a bucket of water close by for all the little mishaps. And have a wonderful Fourth of July!!! Yea for the boys! We have had fireworks at home for years, it never dawned on me not everyone can do it! Sounds as though you’ve gone out of your way to make the first holiday in the new house special. I hope you enjoy the day. Your boys are so awesome! I bet that was some spectacular fireworks display. Thanks for sharing. You have just about the most adorable two boys I’ve ever seen. And your entire menu sounds AWESOME. A cholesterol party, but just awesome! I hope you and they have had the most wonderful of parties .. with the most amazing display .. great day to be had to by all and ending with a BANG ..
Oh my WORD are they excited! I hope it was everything they hoped and more! Those photos really say it all! I hope you all had a wonderful 4th! what adorable photos! There is nothing like excitement in a child eyes! You know you have the cutest kids ever! Those guys could make millions for you acting in commercials. Seriously. We were low on fireworks this year, but there were so many folks camping near our property in the mtns and they all were putting on awesome shows … until well after midnight. We just sat back and enjoyed it all! 🙂 Hope your boys loved the actual event as much as the anticipation! Just had to tell you I made the Fireworks cupcakes yesterday and they were a hit! Thanks so much! Also…on our way home from the coast today…we drove through McMinnville. It’s so beautiful! Can’t wait until you open your winery! They are too cute….how fun for them and what a great menu…and would you look at ALL THAT GREEN….I am soo jealous….everything is baking here in hot as hell az…..so jealous….I â™¥ GREEN!!!!!! I hope you had a fabulous 4th! Those pictures are priceless! Gorgeous, excited boys! You should visit Washington on the 4th and see the crazy kind of fireworks they allow in these parts. Every cul-de-sac is setting off its own full fledged fireworks extravaganza. It is really wild and leaves me twitchy every year. It was weird having the sun stay up so much longer! And near Seattle they have something called “Boom City” with lots of cool fireworks. So much fun and you’re right, we just don’t get that in California.